An almost entirely single location, mostly real time feature seems like a perfect fit for the visual inventiveness of director Michel Gondry and in The We and the I does not disappoint. What is perhaps most surprising though is the way in which Gondry’s use of the film form to manipulate the constraints of the confined Bronx bus that provides The We and the I’s location are mostly extremely subtle, lacking the kind of foreground trickery that made features such as The Eternal Sunshine of the Spotless Mind so extraordinary. This wouldn’t be appropriate here though as everything about The We and the I is dependant on us being embedded with the high school characters travelling home from their last day of school before they part for the summer holidays. And what characters they are, fascinating and richly drawn from the outset. The dialogue that forms the basis of our understanding of theses characters is also so crucial to the film getting under your skin and the words flow out of the mouths of the many excellent young actors as if it were simply plucked from the mouths of actual teenagers in a similar circumstance. It is a smart work of storytelling though that gives this fast paced and often inconsequential sounding dialogue purpose for the character’s development and a sense of narrative significance. Lines that may seem throwaway actually pay off later on and one recurring obsession of the teens on the bus that seems unmistakeably trivial becomes massively resonant in the film’s closing minutes, providing an emotional gut punch that feels at once earned but also entirely unexpected. Throughout the film, which is split into parts for reasons that are not entirely clear, the bus opens up to reveal the many varied characters within. High school archetypes are present and correct but are definitely not mere simplistic stereotypes. The “bullies” on the back of the bus are at the centre of most of what goes on by the very nature of their overly exuberant nature and it is amongst these characters that a reasonable level of shading can be found. Teresa (Teresa L Rivera) in particular provides something of a surrogate role for an audience who may at times find it hard to find a centre amongst the maelstrom of pranking teens. This is particularly significant in the films many funny and not so funny moments. It was clear from the screening I attended that there were many who had not moved beyond the kind of mean humour that was presented here, perpetrated by kids bullying other kids, and it was rather strange to here uninterrupted laughs as teenagers bullied one another. A smattering of awkward laughs or sharp intakes of breathe were also heard though and it is in this reactionary grey area that the film finds a lot of depth to the human interactions on the bus. The teenagers behave badly and are at times incredibly cruel but they are teenagers and it is clear that they still have many things to learn. This development-in-progress provides a strong emotional forward momentum and as the film reaches the aforementioned gut punch finale it is the way in which the characters have grown in this short space of time that one can’t help but shake afterwards. 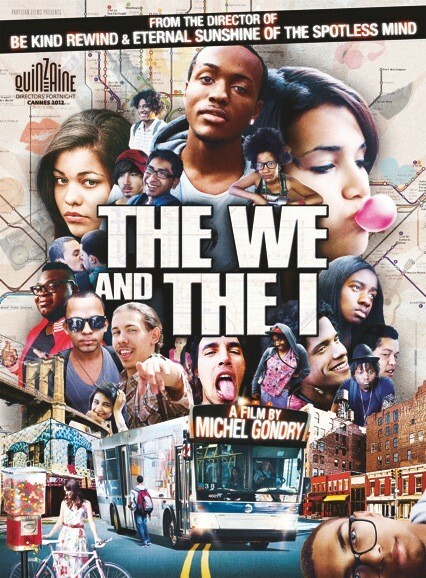 Amusing, oddly gripping and ultimately emotional, The We and the I is another triumph from Michel Gondry, something of an experiment that has paid off no end.